There are pepole, who are impatient, always busy, always ina hurry - preparing or planning new events over and over. It's their lifestyle, their passion - they are like a wind - always moving. My friend, K. is one of those people - I'm very happy we've met each other, as we are very similar in many ways, and the differences we have are so exciting to discover! I've made this quick layout between other, bigger projects - as an experiment and moment to relax. Materiały: stara kartka w kolorze w okolicach zieleni, spraye, maski, tusze alkoholowe, maszyna do szycia, kwiaty papierowe, kropki i kształtki akrylowe. literki tekturowe. 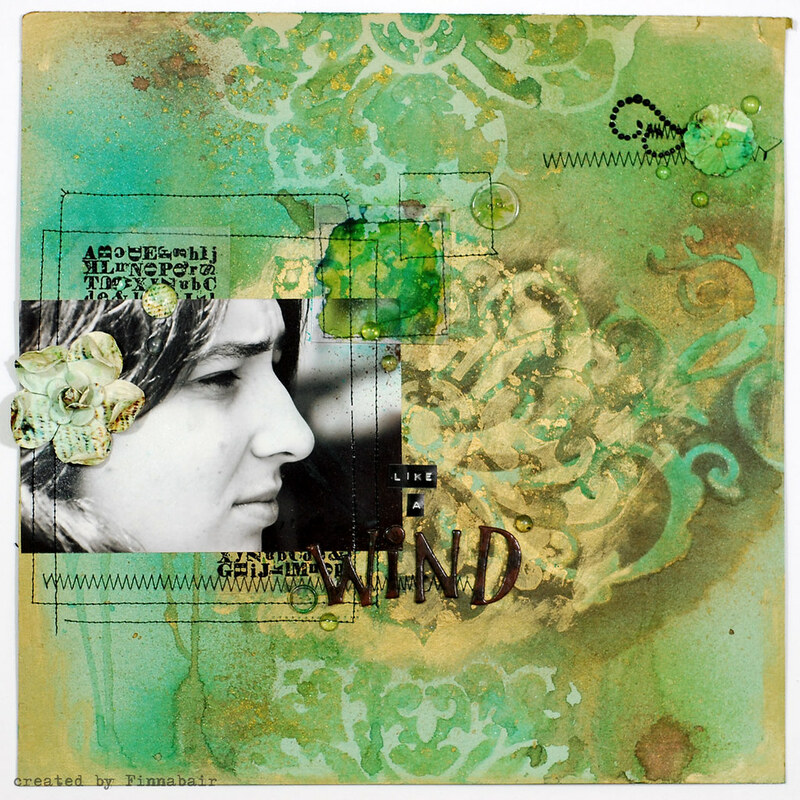 Supplies: an old piece of greenish paper, sprays, inks, alcohol inks, acrylic drops and elements, paper flowers, masks (screens), chipboard letters - and my sewing machine. To tworzenie bardzo lubię, lubię wszystko, jak zwykle! A beautiful piece of art!!!! Your style is amazing! Czy się podoba? No ba! Jest cudny!!!!! A lovely layout, and a wonderful color!!! I love your style and the thecniques that you use are amazing!!! Hi! I saw your great layouts in the Swedish magazine Scrapbooking mm. And now I found you in cyber =). Your work are just stunning!! I got so inspired by you that I made a "steampunk" layout. I sort of lifted some of your stuff. Hope you don´t mind. You can see it here.